You’ve searched for a recommended remodeling contractor and you’ve found us, Lake Hallie Cabinets and Design. 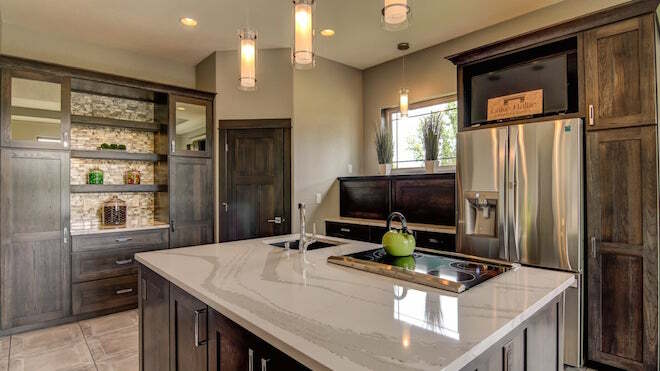 Perhaps you’re in need of a kitchen design with new custom cabinetry and new quartz countertops? Or maybe a bathroom design with new ceramic flooring. As a remodeling contractor, our team not only offers the design services to plan and get you started but our relationship with Eau Claire builders gives us the benefits of their installation expertise. Wondering how it works? This step-by-step renovation process details all the steps of our design services. Get in touch. We offer a variety of design services and products; from custom flooring installation to bathroom and kitchen design. Give us a call to schedule a free design consultation on see how our design services can benefit you. Let’s talk. You’ll meet with the Lake Hallie Cabinets & Design team to discuss your project. We’re ready to talk measurements, drawings, pictures or any other ideas you might have to share. As a recommended home remodeling contractor, we have several years of interior design experience in Eau Claire and Chippewa Falls. Going over the numbers. Once we have your project details, we’ll prepare a customized proposal for your project and detail the associated expenses. Wondering about the cost of the marble countertop you’ve chosen along with your new custom kitchen cabinets? We’ll be ready with all the details. Remember too that custom doesn’t have to mean expensive. We have a broad range of products to fit most any budget. Once we have an accepted budget proposal, a retainer deposit will get you scheduled for our next steps. We come to you. A complete in-home analysis allows us to walk through your home. Do we have any project additions or a change in product type? We’ll be able to make any necessary adjustments to the design and final quote of your project. Time to get started. Once the final proposal is accepted, a 50% deposit gets you on our schedule. You will be assigned a project manager who will oversee all aspects of your project. They’ll keep you informed throughout the process and will consult with you along the way. The end is in sight. As your interior design project nears its completion, a final walk through takes place with your project manager and designer. We’ll inspect all the work together as our goal is to exceed all of your expectations. Your vision fulfilled. Your project is complete, we invoice for final payment and it’s time to enjoy your home’s new interior design. All of us at Lake Hallie Cabinets and Design look forward to the opportunity to work with you. If you have any questions, please contact us by calling us at (715) 839-9701 or contact us by email here. Looking for more information from Lake Hallie Cabinets and Design? Like us on Facebook and stay up-to-date!